Simple Coolog has a simple usage. We make it as simple as possible to setup Coolog. Also, we provides some simplified methods of basic function. Flexible Coolog provides multiple log methods (Console, NSLog and File) and log-level. Expandable You can even customize your own logger and formatter, which are components of log-driver. 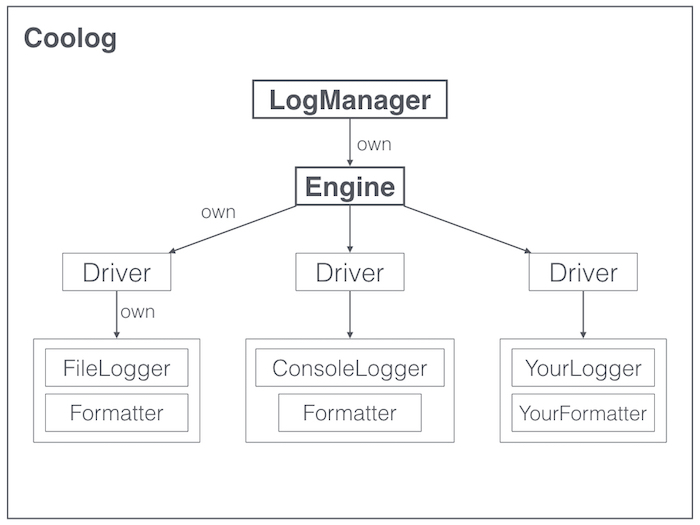 Then your customized log-driver can also be added to log-engine. Do whatever you want in your customized logger. Web Browser Tool Coolog provides a web browser tool, which makes it easy to debug. You just need to open a computer with a browser to debug the program. This is really convenient. The section below will introduce how to customize your own logger. You can follow 3 steps below. Step 1: Implement your own logger. // This is your own log method. It will be called by log engine. //For example, here below uses os_log as its implementation. Step 2: Implement your own formatter. // The log's format depends on this method. Step 3: Add your logger to log engine. Yet another logger framework for Swift/Objective-C.